This is the third of the three major Roman structures in the city. The Odeon is usually a smaller theater next to a larger Amphitheater in the Roman world. Accordingly, this 500-seat ancient theater built in the second century CE is close to its larger and more famous companion. It was probably used for more intimate performances than those held at the amphitheater. And notably, such use of the theater continues today with musical concerts, especially the Al-Balad Music festival. It is thought that once upon a time the structure must have had a wooden roof. Unless there is an event happening there is not much to see here but the photographs always come out nice, especially in twilight. In more recent history the theater is famous as the place of safe haven for 50000 Palestinian refugees fleeing their homes when they were displaced by the newly-created Israel in 1948. Timings may vary according to the show. How popular is The Odeon Theater? People normally club together Jordan Archaeological Museum and Roman Nymphaeum Amman while planning their visit to The Odeon Theater. Cool historical site in the center of Amman. It is an inexpensive site to visit and includes two smaller museums in the fee. There is a lot of parking options on the main strewt and surrounded by food and gift shop options. The small museums have local art, coffee, and clothing exhibits and include photograph opportunities. This is like a compact version of the big Roman Theater next to it. But, it seems to be in better condition (restored?) and feels more welcoming. There are some funky acoustics if you stand at the center of the arena. 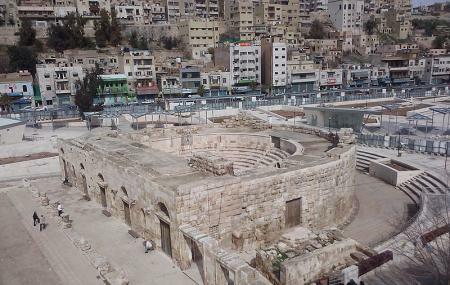 The roman theater is more impressive as it is way larger, yet this place has lots of concerts in the summer, must go!